One of the most interesting prophesies concerning John the Baptist is Malachi 3:11, “See, I will send my messenger, who will prepare the way before me. Then suddenly the Lord you are seeking will come to his temple; the messenger of the covenant, whom you desire, will come,” says the Lord Almighty. God spoke this to the people of Israel, because they had asked, “……Where is the God of Justice?” (Malachi 2:17). The prophecy concerning the first messenger is quoted in all four Gospels and it is clear that they are talking about John the Baptist. There is no doubt about that, but the “messenger of the covenant” is not mentioned any place in the four Gospels. The reason is clear, because this verse is not talking about His first coming. It is not talking about when He is coming in grace as the Redeemer but when He will come as judge. In Luke 12:14, He said, “Man, who appointed me a judge or an arbiter between you?” He came the first time to save. The next time He comes it will be as king and sovereign. I consider the Second Coming to occur after the Great Tribulation when He will begin the thousand-year reign over His kingdom. Some call the Rapture of the Church the Second Coming, but I don’t, because when He calls His church, out of the world, He will meet them in the air. He doesn’t set foot on the earth at the Rapture. Each Gospel quotes Malachi 3:1 and I would like to look briefly at those passages. Matthew 11:9-10 says, “Then what did you go out to see? A prophet? Yes, I tell you, and more than a prophet. This is the one about whom it is written: “I will send my messenger ahead of you, who will prepare your way before you.” And in Mark’s Gospel, we find, “It is written in Isaiah the prophet: ‘I will send my messenger ahead of you, who will prepare your way.’” (Mark 1:2). Then Luke writes in Luke 7:27, “This is the one about whom it is written: “I will send my messenger ahead of you, who will prepare your way before you.” John recorded these words in John 1:23, “John replied in the words of Isaiah the prophet, ‘I am the voice of one calling in the desert, Make straight the way for the Lord.’” Two of the quotes were from Isaiah but Malachi had the same thing to say about John the Baptist. This was God’s answer to the people of Israel. God will send Jesus first as a Savior, but the next time He will come as “the messenger of the covenant” to execute judgment on the world. God has made it very clear that He is going to judge sin. If you will not have Him as your Savior, you will have Him as your judge. God put the judge’s robe on His Son. And in the book of Revelations, we are told about the Great White Throne Judgement where the lost will be judged; you are not going to get by with sin. This is the covenant that God made with Israel. He reaffirmed it in Deuteronomy 4:23, “Be careful not to forget the covenant of the Lord your God that He made with you; and do not make for yourselves an idol in the form of anything the Lord your God has forbidden.” Israel turned from God to idols many times and even to the occult. They never once got away with this sin, because God would turn them over to their enemies. come soon, but that when Jesus returns, it will happen suddenly. The one that we know in the New Testament as the Lord Jesus Christ is the “messenger of the covenant” of the Old Testament. He is also Emmanuel, Savior, and God. Now let’s look at how the birth of John the Baptist was recorded in Luke’s Gospel. Friends and family wanted to name the baby after his father, which was the common practice, however, Elizabeth set the crowd straight. Zechariah has been dumb for almost nine months, but now he can speak and his first words are a song of praise. Everyone recognized that John was going to be an exceptional child. It is clear that Zechariah understands that his son will be the forerunner of the Messiah. He rejoices because the coming of the Messiah is now very close. God made these promises to Abraham. And Zechariah, Elizabeth, and Mary believed He would keep His promises. Today, some people believe that God is through with Israel and that God isn’t going to keep His promises to them. I believe that God will keep every promise that He ever made. If I believe that He is going to keep the promise He made to me in John 3:161, then I must believe that He will keep the promises He made to Abraham. 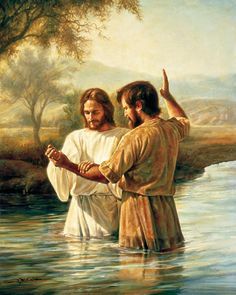 “And you, my child, will be called a prophet of the Most High; for you will go on before the Lord to prepare the way for Him, to give His people the knowledge of salvation through the forgiveness of their sins, because of the tender mercy of our God, by which the rising Son will come to us from heaven to shine on those living in darkness and in the shadow of death, to guide our feet into the path of peace.” And the child grew and became strong in spirit; and he lived in the desert until he appeared publicly to Israel. (Luke 1:76-80). John knew that he had a very special task to perform for God. He was to prepare the way for the Messiah. He knew that the Messiah was somewhere close at hand. He was a prophet of the Most High. Later Jesus would pay John the greatest compliment that He ever gave to any man. 1 (John 3.16) “For God so loved the world, that he gave his only begotten Son, that whosoever believeth in him should not perish, but have everlasting life.” The gospel in a nutshell. The love of God shown in action. (1) The source of love—God. (2) The extent of love—the world. (3) The sacrifice of love—He gave his only begotten Son. (4) The results of love—whosoever believeth in him should not perish. Put your sermons in your sermon file, not in the generic sermon area!